12 x 6 Designer Finish Baseboard Return Grille Discounts Apply ! Replace your old and dated baseboard return grilles with these beautiful designer finished baseboard returns. 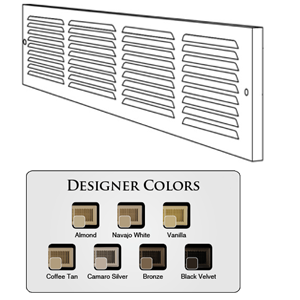 Instead of only having a choice of white or brown finishes or expensive custom options, these decorative vent covers allow you to customize to your decor while being completely affordable. The designer finished baseboard returns are made of all steel for durability. The included installation screws match the finish you order. Each decorative vent cover comes out from the wall 7/8", so it will match up with the thickness of your baseboard trim. Install the baseboard return grille with louvers in up or down position for best duct concealment. This Shoemaker brand baseboard return is special order/non-returnable. This item takes approximately 4-6 weeks to ship out. - Depth from wall 7/8"
- Overall Faceplate Size: 13 1/2" x 7 1/4"
This rectangular baseboard return is also available in other sizes. Browse the full line of Shoemaker designer finished baseboard return grilles.